“Market conditions are changing. The continued rise in interest rates suggests we are in the early stages of a bond bear market, which could intensify as central banks withdraw liquidity. The receding tide of liquidity will start to reveal more rocks beyond what has been exposed in emerging markets so far, and the value of a value discipline will be in avoiding the biggest capital-destroying rocks. If a rock emerges on the crowded shore of U.S. momentum, it could result in a major liquidity challenge, as momentum is often most intense on the downside as a crowded trade reverses. So investors are facing a large potential trade-off right now: continue to bet on the current dominance of momentum and the S&P 500, or bet on change and take an active value bet in names with attractive value and optionality, but with negative momentum,” said Clearbridge Investments in its market commentary. We aren’t sure whether long-term interest rates will top 5% and value stocks outperform growth, but we follow hedge fund investor letters to understand where the markets and stocks might be going. This article will lay out and discuss the hedge fund and institutional investor sentiment towards Healthcare Trust Of America Inc (NYSE:HTA). Healthcare Trust Of America Inc (NYSE:HTA) was in 16 hedge funds’ portfolios at the end of September. HTA has experienced an increase in activity from the world’s largest hedge funds lately. 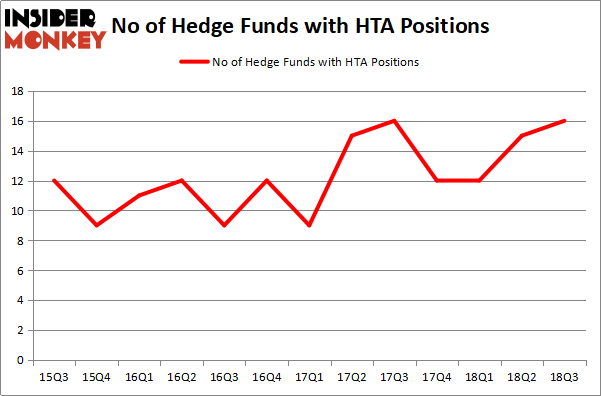 There were 15 hedge funds in our database with HTA holdings at the end of the previous quarter. Despite this, HTA didn’t come close to be included in the list of the 30 most popular stocks among hedge funds in Q3 of 2018. In a Nov. 3 research note, Zacks Investment Research raised shares of the medical real estate investment trust from a “sell” rating to a “hold” rating. ValuEngine raised the stock from a “sell” rating to a “hold” rating in a research report published Aug. 15. Mizuho raised shares from a “neutral” rating to a “buy” rating and set a $32.00 price in a Nov. 13 note. Meanwhile, Morgan Stanley dropped HTA shares from an “overweight” rating to an “equal weight” rating and lowered their price target for the stock from $27.00 to $26.00 in an Aug. 16 research report. One analyst rated the stock with a sell rating, six at hold, while four issued a buy rating to the company. The REIT has an average rating of “Hold” and a consensus target price of $30.40 per share. We’re going to go over the key hedge fund action encompassing Healthcare Trust Of America Inc (NYSE:HTA). How are hedge funds trading Healthcare Trust Of America Inc (NYSE:HTA)? At Q3’s end, a total of 16 of the hedge funds tracked by Insider Monkey were bullish on this stock, a change of 7% from one quarter earlier. Below, you can check out the change in hedge fund sentiment towards HTA over the last 13 quarters. With hedgies’ sentiment swirling, there exists a select group of notable hedge fund managers who were adding to their holdings substantially (or already accumulated large positions). The largest stake in Healthcare Trust Of America Inc (NYSE:HTA) was held by AEW Capital Management, which reported holding $92.3 million worth of stock at the end of September. It was followed by Millennium Management with a $65.2 million position. Other investors bullish on the company included Balyasny Asset Management, Renaissance Technologies, and Echo Street Capital Management. Consequently, some big names have been driving this bullishness. Tudor Investment Corp, managed by Paul Tudor Jones, established the most valuable position in Healthcare Trust Of America Inc (NYSE:HTA). Tudor Investment Corp had $2.4 million invested in the company at the end of the quarter. D. E. Shaw’s D E Shaw also initiated a $1.4 million position during the quarter. The other funds with brand new HTA positions are George Zweig, Shane Haas and Ravi Chander’s Signition LP and Matthew Hulsizer’s PEAK6 Capital Management. 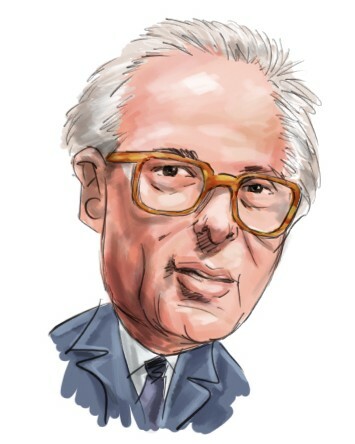 Let’s go over hedge fund activity in other stocks – not necessarily in the same industry as Healthcare Trust Of America Inc (NYSE:HTA) but similarly valued. These stocks are Sonoco Products Company (NYSE:SON), Semiconductor Manufacturing Int’l (NYSE:SMI), Buckeye Partners, L.P. (NYSE:BPL), and Genesee & Wyoming Inc (NYSE:GWR). This group of stocks’ market valuations are similar to HTA’s market valuation. As you can see these stocks had an average of 11 hedge funds with bullish positions and the average amount invested in these stocks was $109 million. That figure was $321 million in HTA’s case. Sonoco Products Company (NYSE:SON) is the most popular stock in this table. On the other hand Semiconductor Manufacturing Int’l (NYSE:SMI) is the least popular one with only 5 bullish hedge fund positions. Healthcare Trust Of America Inc (NYSE:HTA) is not the most popular stock in this group but hedge fund interest is still above average. This is a slightly positive signal but we’d rather spend our time researching stocks that hedge funds are piling on. In this regard SON might be a better candidate to consider a long position.